Recently, ladies from the “Still Stitching with Susan” group from the Unites States again visited Eschwege to further their knowledge of Schwalm whitework with me. 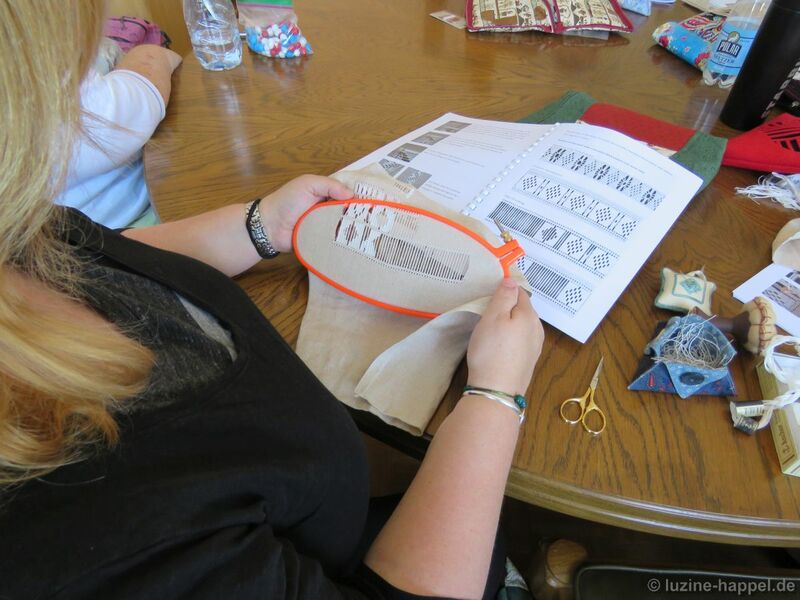 #1 Happel Hearts, Lesson #2 Tulip Wreath, and Lesson #3 Openwork Circle Design Ornaments in 2015 and 2016. One student new to the class practiced the first steps of Schwalm whitework at home already along my books and so she could start working on the lesson #2 subject – the tulip wreath. 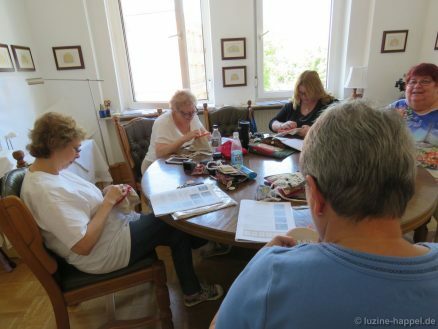 All the others wanted to learn needle-weaving band patterns this time. 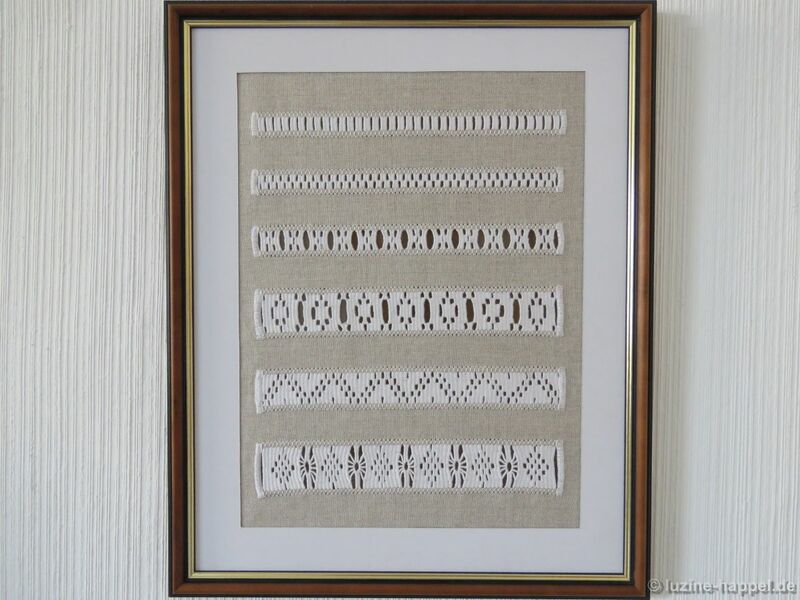 We decided for a small sampler showing 6 different needle-weaving bands. 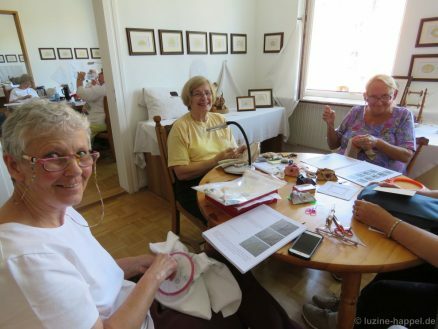 To avoid language difficulties while teaching and to enable them to finish the ambitious project themselves after learning and practicing in Eschwege, I prepared a written instruction. The lesson #4 booklet Needle-Weaving Band Sampler with its great detailed descriptions and illustrated step-by-step instructions got in the end 45 pages. It was perfectly edited by my professional editor Joey Colbert. We worked in my exhibition rooms. This allowed to always look to different traditional and contemporary examples. 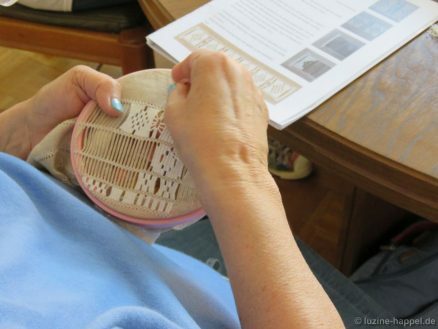 The ladies could look to so many different needle-weaving band patterns. They could view hems made with different heavy threads and different density. They compared different thread tensions. 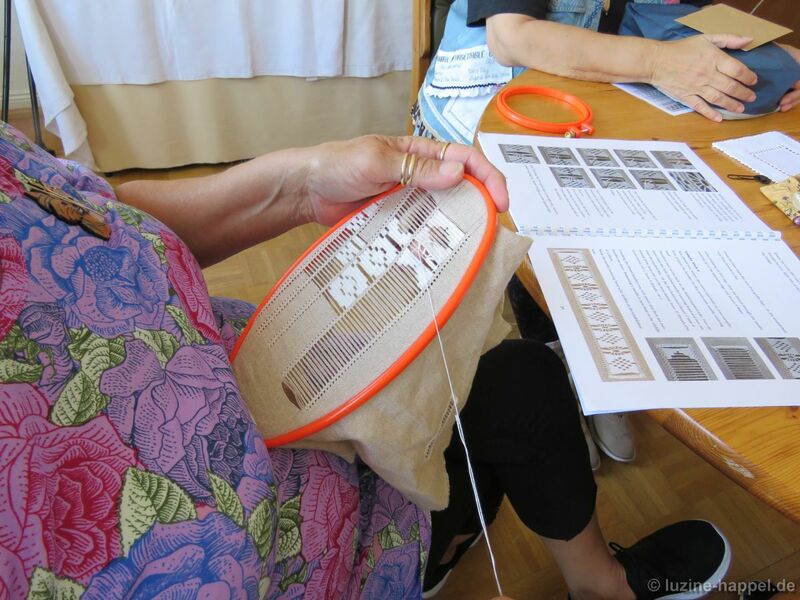 And they noticed different spiders included into the needle-weaving. They saw different edge solutions. 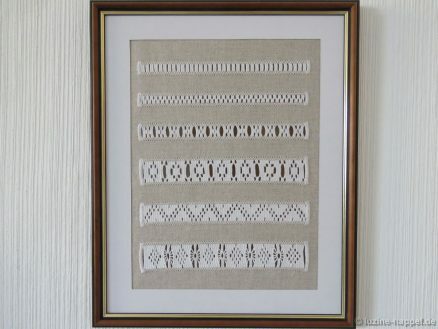 And they looked to needle-weaving bands combined with other stitches. Standing up and looking around brought short breaks in the long hours of sessions. It is a very special and unique thing to teach in exhibition rooms with so many different exhibits. It would impossible to bring such a lot of examples to another teaching room. 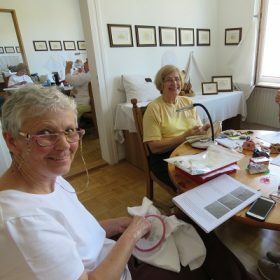 Included in the group was the needlework shop owner Kimberly Young of Sassy Jacks Stitchery, Kimberly has in stock all the needed materials and equipment for Schwalm whitework, especially the Weddigen linen with 13.5/cm thread count! Please call her with your request. She also stores a couple of my books. 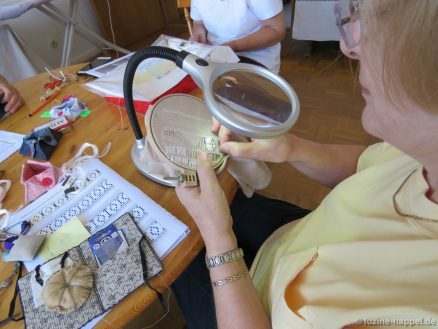 Susan Greening-Davis, the initiator of the teaching travel, and Kimberly now offer Schwalm whitework classes in the US. Das schaut sehr gemütlich aus! Toll das deine Stickereien auch so gut in Amerika angenommen werden. Ja, das weltweite Interesse an Schwälmer Weißstickerei ist groß. Beautiful sampler. Such pretty woven bands. I don’t think I could concentrate on stitching with all that inspiring Schwalm embroidery on display. Seeing inspiring exhibits have an spurring effect on working similar beautiful pieces. What a wonderful learning experience, especially taking place in your exhibition area. I wish I could come again to visit and will plan it for a future trip. Its a good idea, Heather, to plan a newly visit for a future trip. Then you can view a lot of new and interesting exhibits. 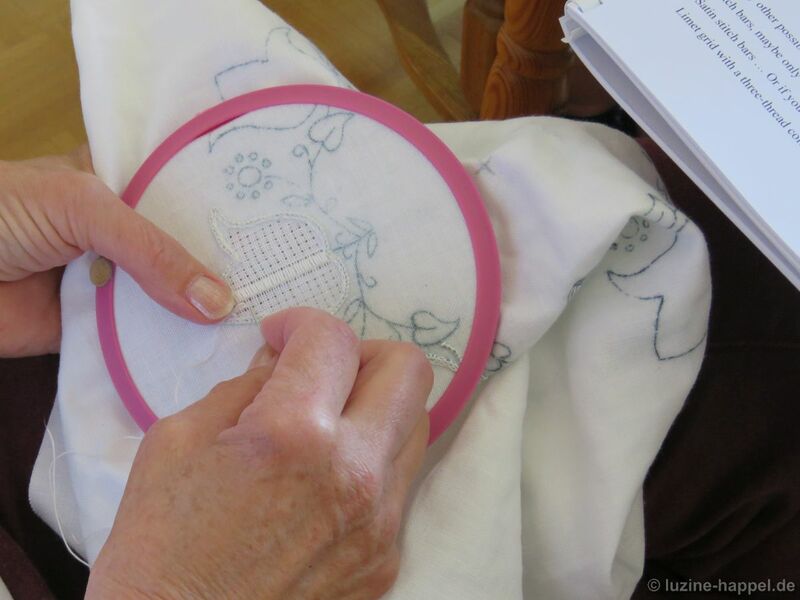 The time is always creeping too fast and can can not embroider as much as I want – but some elaborate and very special cloths are finished so far.